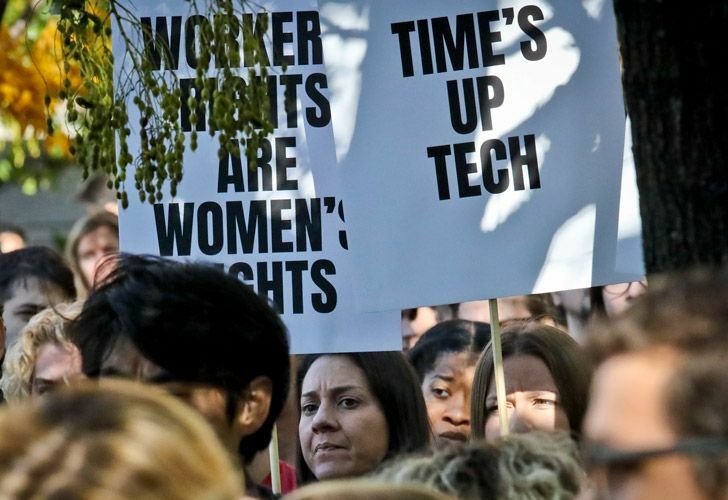 Demonstrations comes after a New York Times investigation unveiled years of sexual harassment allegations at Silicon Valley firm and a lack of transparency over the cases. Thousands of Google staff across the world staged a series of walk-outs Thursday to protest the company’s response to allegations of sexual misconduct and demanding publicly disclosed sexual harassment transparency reports. 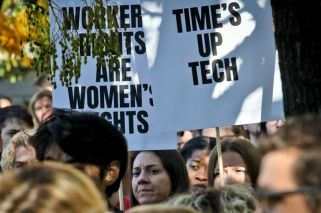 Demonstrations began at 11.10am in Tokyo – and at the same time in London, Berlin, New York and many other cities – as employees walked out of their offices leaving the following note on their desks: "I’m not at my desk because I’m walking out with other Googlers and contractors to protest sexual harassment, misconduct, lack of transparency, and a workplace culture that’s not working for everyone." The Google protest, billed "Walk-out For Real Change," is unfolding a week after a New York Times story detailed allegations of sexual misconduct about creator of Google's Android software, Andy Rubin. The report said Rubin received a US$90-million severance package in 2014 even though the company had confirmed sexual misconduct claims against him were credible. Rubin has denied all the allegations. The Times also reported a number of other Google executives, including Richard DeVaul, a director at the Google-affiliated lab that created far-flung projects such as self-driving cars and internet-beaming balloons. DeVaul had remained at the "X'' lab after allegations of sexual misconduct surfaced about him a few years ago. He resigned Tuesday without severance, Google confirmed. Google CEO Sundar Pichai apologised for the company's "past actions" in an email sent to employees Tuesday. "I understand the anger and disappointment that many of you feel," Pichai wrote. "I feel it as well, and I am fully committed to making progress on an issue that has persisted for far too long in our society. and, yes, here at Google, too." Pichai also insisted that the company had taken a “hard line” over sexual misconduct, disclosing that Google had fired 48 employees, including 13 senior managers, for "sexual harassment" in recent years without giving any of them severance packages. “Employees have raised constructive ideas for how we can improve our policies and our processes going forward. We are taking in all their feedback so we can turn these ideas into action,” he said. Google and its parent company, Alphabet, employ 94,000 people worldwide. Co-ordinated action of this scale is unprecedented at the company, but follows a trend for increasingly impassioned employee activism. The protests are the latest backlash against men's exploitation of female subordinates in business, entertainment, technology and politics. In Silicon Valley, women also are becoming fed up with the male-dominated composition of the technology industry's workforce — a glaring imbalance that critics say fosters unsavoury behaviour akin to a college fraternity house. "Why do they think it's OK to reward perpetrators & further violate victims?"